Reflections & Connections – Conference Registration Now Open! 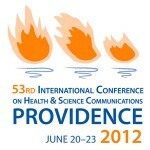 Registration for HeSCA’s 2012 annual conference, Reflections & Connections, is now open. HeSCA meetings are known for their mix of presentations on state-of-the-art issues in health and science communications mixed with just the right amount of networking activities. This year is no exception. Please register before May 25 for the best rate.